Inspired from sidewinders snakes, researchers at the Georgia Institute of Technology, Carnegie Mellon University, Oregon State University and Zoo Atlanta collaborated and designed a robotic snake that can actually slide and move on various terrains without obstructions. Sidewinder (Crotalus cerastes) also known as horn viper, are the inhabitants of South western U.S. and parts of Mexico . These snakes belonging to one of the most venomous categories are more well-known for their swift and hasty movements. They can move on any topographic location, they can slide across land, they can swim, they can climb rough surface, and can even glide in air. They can move over a sandy surface, plain or inclined, without falling back. 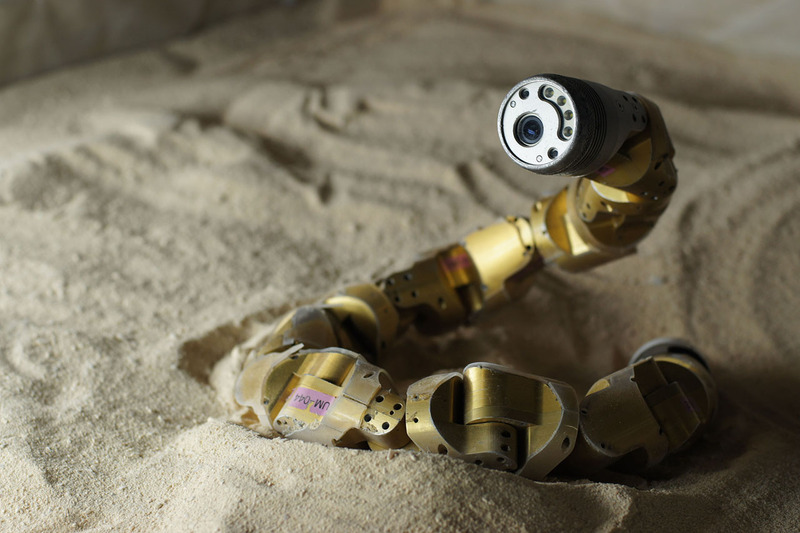 In order to design these robotic sidewinder snakes, researchers of the Universities went to Atlanta for a close inspection of locomotion of these snakes. A sidewinder was put on an inclined plane of sand and high resolution cameras observed its filthy movements. On close examination, astonishing results showed up. Researchers observed that snake had a unique way of lifting one section vertically and other horizontally. Also, the snakes not move side-to-side they also move up-down and each movement is directed at a right angle to the surface. While traversing up, it always keeps its head down towards the plane. “We realized that the sidewinder snakes use a template for climbing on sand, two orthogonal waves that they can control independently. We learned there are three different failure regimes, which we can avoid by carefully adjusting the aspect ratio of the two waves, thus controlling the area of the body in contact with the sand”, said Hamid Marvi, one of the researcher. These pioneering efforts of various hands can lend mankind with an intriguing product which can reach to inaccessible areas and help in rescue and search operations. For some reason I thoroughly enjoyed how this article was written.